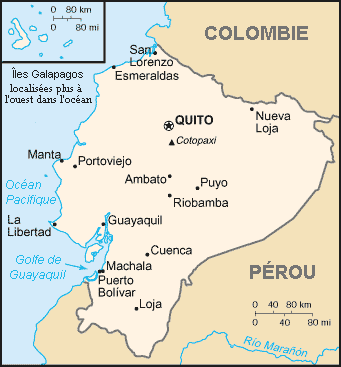 Ecuador : When and where to go? The climate is tropical with two major seasons showing variations caused by altitude and area. The rainy season lasts from December to May in the mountains and from January to April on the coast with rain most days. The dry season lasts from June to November in the mountains and from May to December on the coast, with less humidity and temperatures more comfortable. In the centre of the country temperatures are moderate, around 25ºC throughout the year. The weather is usually quite unpredictable, so anytime is the best time for visiting the country: The dry season is more favourable for hiking at altitude and it is pleasant to discover the Amazon between September and January. Ecuador is a small country; however, this is definitely an most amazing destination: A huge variety of landscapes and multiple cultures, beautiful colonial architecture - all these elements combine to make this country a land of adventure and discovery. Quito, the capital, has a reputation as a beautiful city: At around 3000 meters altitude and surrounded by mountains it offers visitors a fascinating labyrinth of narrow streets, beautiful churches, peaceful squares, colonial houses, the monastery of St Francis and many other wonders. Follow the road from Quito to Otavalo with its unforgettable landscapes and discover the Indian market which offers beautiful handicrafts and where you will meet people dressed in their traditional costumes. Later, visit the Indian villages of Volcano valley, to the south of Quito, camp in the vertiginous mountains where the way of life seems to remain unchangeable in this grandiose location. The city of Cuenca is also a stopover not to be missed: Take a stroll along the narrow streets and later visit the pre-Columbian Ingapirca site located 50 km further north. The Galapagos archipelago is a must-see location for animal lovers: Sea lions, pelicans, northern gannets, penguins, dolphins, giant turtles, all will make a deep impression. They can be visited only with an organized tour in order to preserve this unique natural haven. There is a flight to Quito from Paris via Amsterdam. EU citizens don't require a visa to stay for less than 3 months. The currency in circulation is the U.S. dollar. The budget required is not very high: A double room costs less than €30, and a copious meal €6 or €7. Regarding health, it is best to follow these basic rules: Do not drink tap water, do not eat raw vegetables, be alert to acute altitude sickness, protect yourself against mosquitoes, and keep your routine vaccines up to date and add those for yellow fever and hepatitis A. To travel within the country, domestic flights are frequent and reasonably priced. The bus is the means of transportation most commonly used and it is also a great way to see the country.